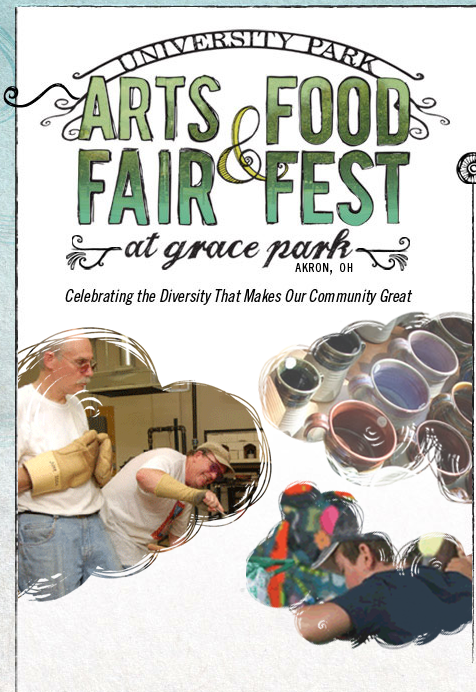 University Park Alliance (UPA) is proud to present the 2011 University Park Arts Fair & Food Fest at Grace Park. The annual festival (formerly known as the University Park Arts Fair) will take place on Saturday, Aug.13, 10 a.m. – 6 p.m. at the historic Grace Park on the corner of Perkins St. and Prospect St. in University Park. The festival will feature lively entertainment, fine art and fine crafts from more than 100 local and regional artists, international food by Akron locals and more. The University Park Arts Fair & Food Fest is a wonderful venue for artists to showcase their work, and it offers visitors an opportunity to visit and appreciate the beauty of Akron’s oldest park. Admission to the event is free and plenty of parking will be available. For information on how to become a vendor, exhibitor or sponsor, please click through the site or email info@universityparkartsfair.org or call (216) 272-2741. Want to display your work at the arts fair? This entry was posted in akron, Art News, arts, music, ohio, photography, shows and tagged akron, Alliance, art, art news, concert, exhibit, exhibition, live, music, ohio, show, University Park, UPA. Bookmark the permalink.